Coming from the very loud and noisy baboons to one of our quietest, but largest visitors in Camp. The sole of an elephant’s foot is covered in a thick epidermal layer tissue, allowing the heaviest land-based mammal to move surprisingly silent. It’s usually just the sound of cracking branches that will give it away, so always listen carefully when walking through the Camp. 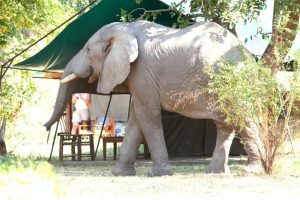 Throughout the year (but increasingly in Dry Season), you are likely to encounter our grey giants in and around the Camp, as well as in the surrounding GMA. 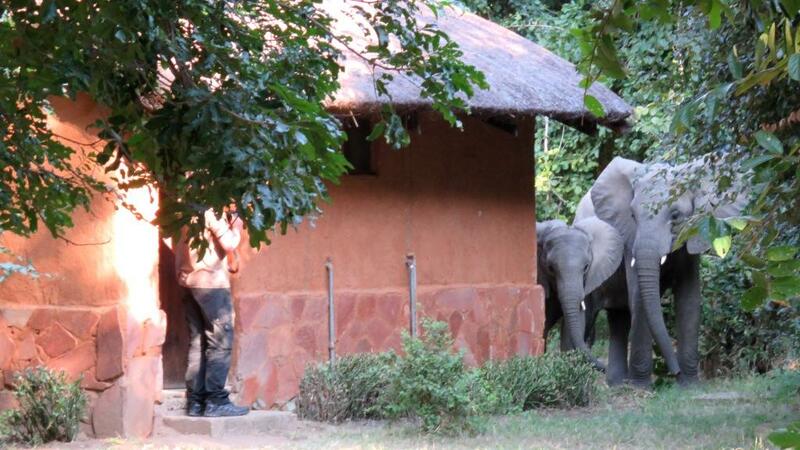 Elephants in Camp make for a spectacular and unforgettable sighting, but always make sure to keep your distance. Our staff and watchman are very experienced with these encounters and will ensure your safety throughout your stay. Special caution should be applied when encountering mothers with young calves (as these are very protective over their young) as well as male elephants in must (which are flooded with up to ten times as much testosterone as usual and tend to be extremely aggressive, they discharge al almost continuous dribble of urine as they walk). 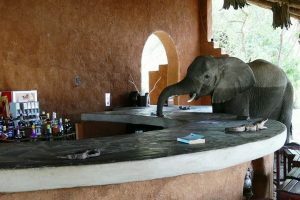 People usually distinguish between a mock and a real elephant charge, each of them displaying distinct behavior patterns. During a mock charge the elephant will most likely rush towards you while standing tall and spreading its ears to make itself appear bigger and more intimidating. It will stop abruptly in front of its target, visibly distressed, swinging its trunk or aggressively kicking dust. 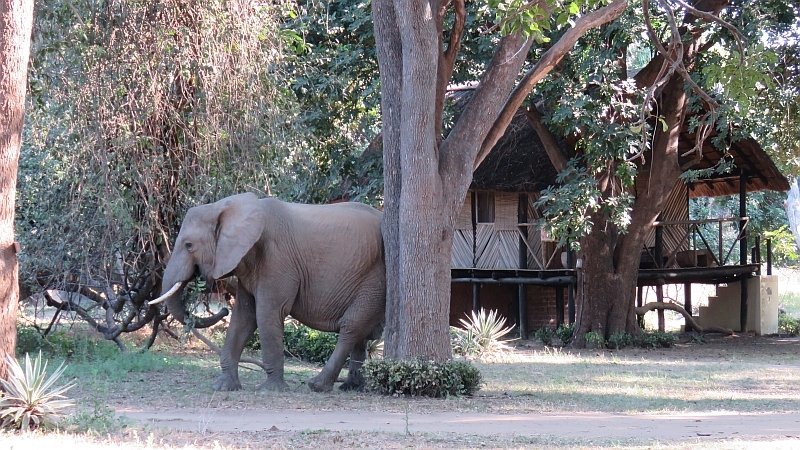 During a real charge the elephant’s ears will lie flat against the sides of its head, pinned back, and the head lowers in order to position his trunk onto its target, and then it will sprint towards you. 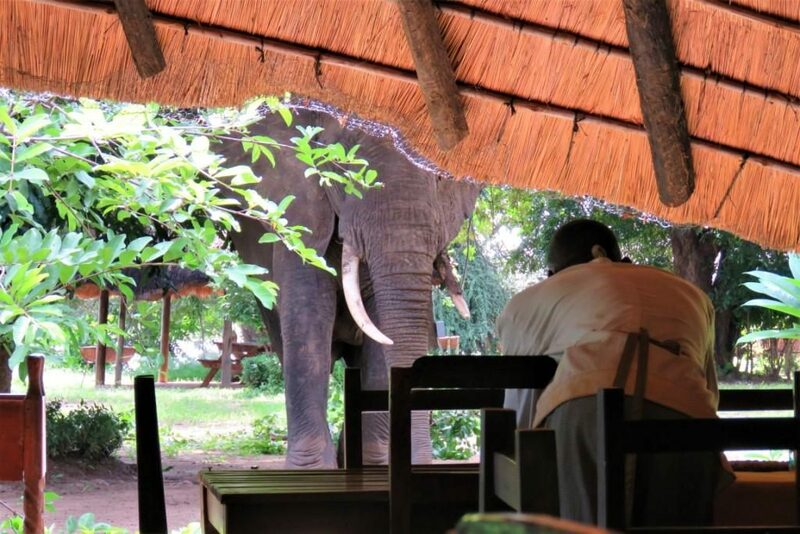 It takes a great amount of experience to identify an elephant’s mood, so it is very advisable to respect their space and back off as soon as you see any kind of irritation in general. 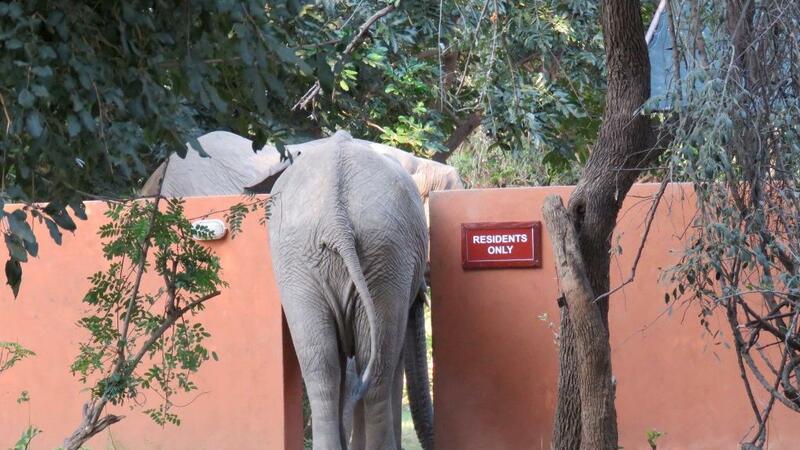 If an elephant causes a threat to our guests, our staff is capable of intervening. It’s probably unsurprising that an elephant’s nose is not only the longest in the animal kingdom, but also the most effective one. 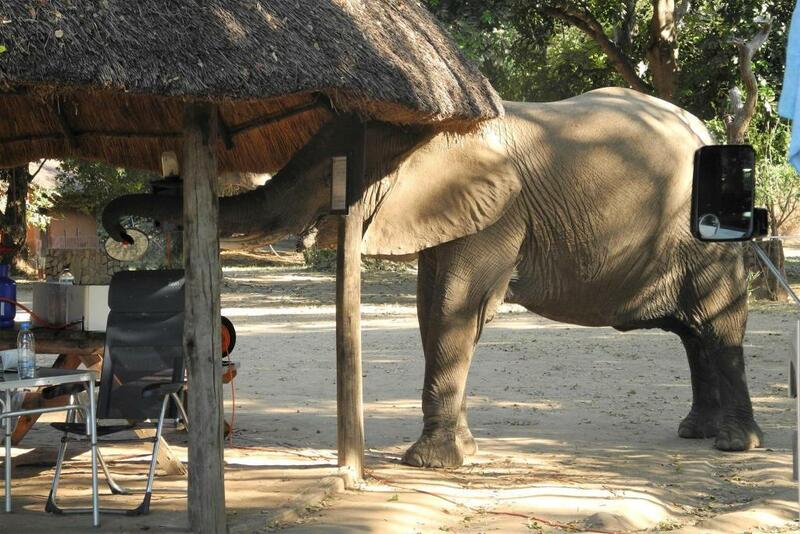 Researchers have discovered that African Elephants have the most genes dedicated to smell (2000), which is the most ever discovered in any animal (More than double the number compared to domestic dogs and five times more than in humans). 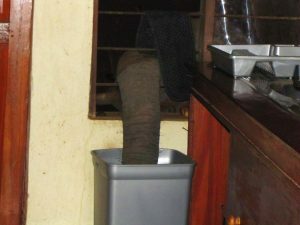 That might explain to you why our staff is so insistent in telling you to lock your food away, as we have experienced elephants to not be particularly hesitant after picking up the scent of fresh food (especially fruit and vegetables). Broken windshields, doors and tents are nothing new to us. Interesting Fact: Scientists have proved that elephants, like us, are empathetic beings, who display behavior related to grief, altruism and compassion. 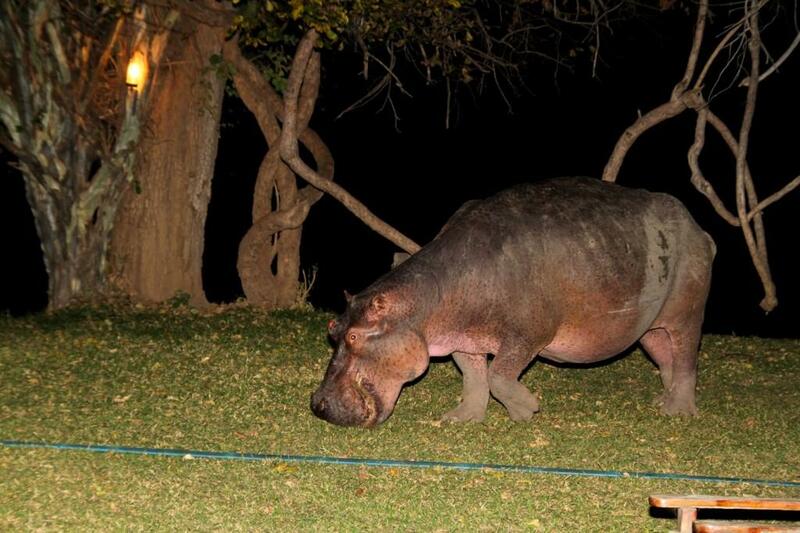 You probably never knew how big a hippo actually is until you personally encounter one on land. 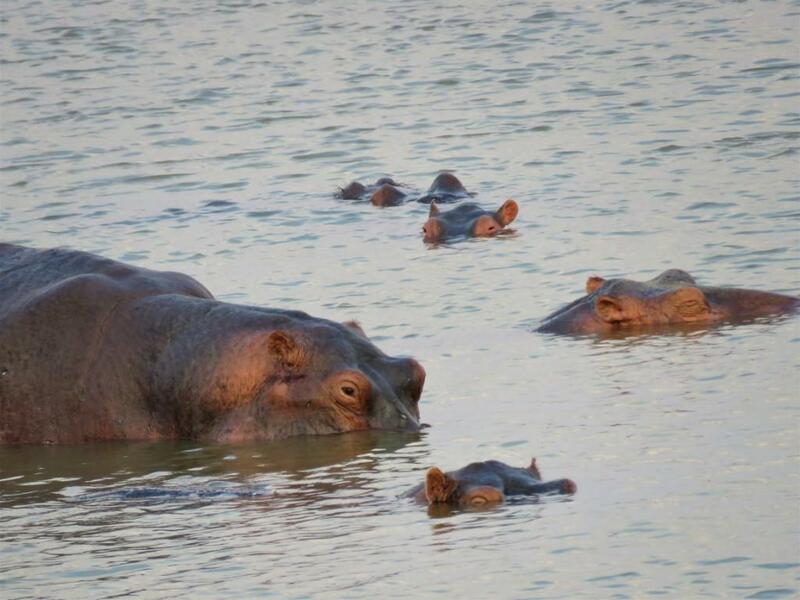 In South Luangwa it is generally hard to not see a hippo, as it accommodates one of the biggest hippo populations in Africa, with an estimated 50 hippos per km of the Luangwa River. Believe what you see in Disney Movies and hippos are among the most gentle of Africa’s giants, wearing pink tutus and ballerina shoes. Although displaying a rather funny look with their swollen bellies and stubby legs, hippos are actually remarkably agile and aggressive. 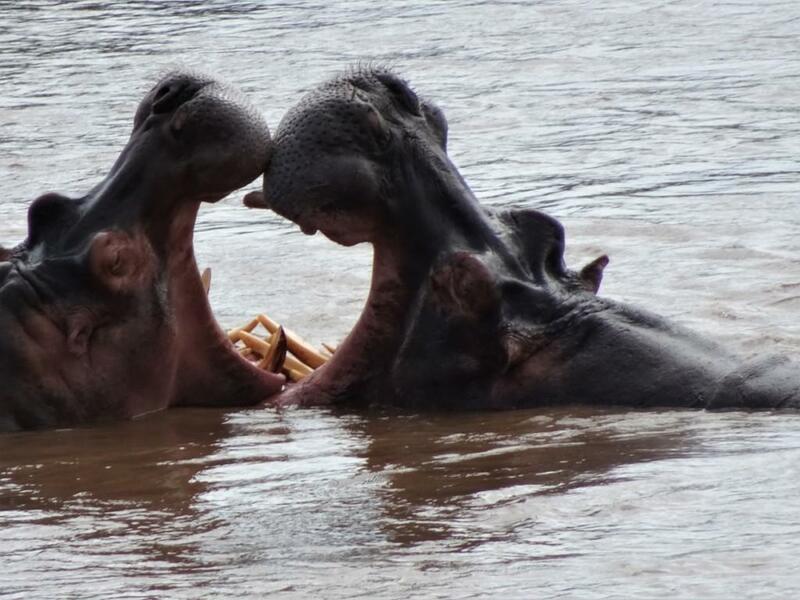 With their combination of sheer size, sharp teeth, mobility (speed up to 30 km/h) as well as their aggressive streak and very territorial behavior, hippos are often described as Africa’s deadliest large land mammal. About 500 people die from a hippo attack every year. Hippos have a unique skin that needs to be kept moist and secretes a red fluid that works as a sunscreen, antibiotic and skin moisturizer. Staying out of the water for too long can cause overheating and dehydration. Hence you will be able to observe our neighboring hippo families relaxing in and around the Riverbed and the Lagoon for most of the day, every now and then breaking the silence through a hysterical laugh (which sounds comical, but is actually meant as a threat, same as the famous hippo jawn). You might also observe male hippos wiggling their tail to spread their poo all around to chase away other males (very charming), as well as engaging in brutal battles over mates, slashing and biting with their fearsome teeth. 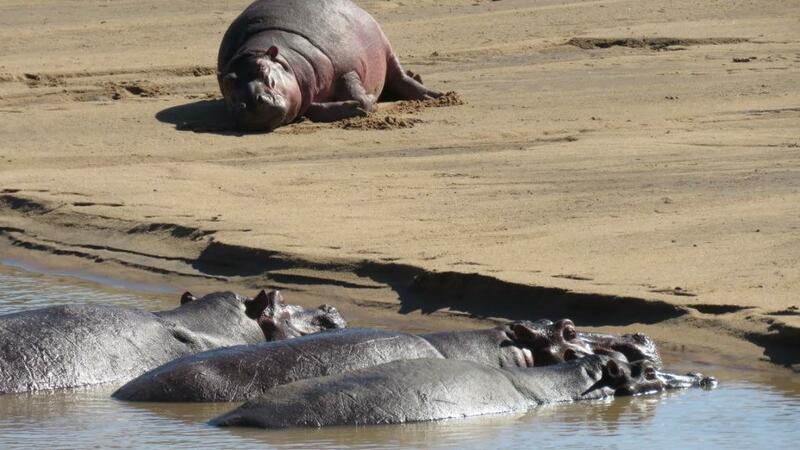 To avoid the direct sun and heat, hippos will leave their wet refuge and will come out to graze at about dusk. 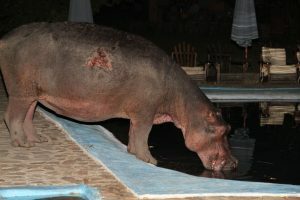 They engage in a mostly herbivore diet, but there are scattered reports by scientist and tourists having observed hippos attacking and eating other animals, and even scavenging carcasses, including those of their own kind. 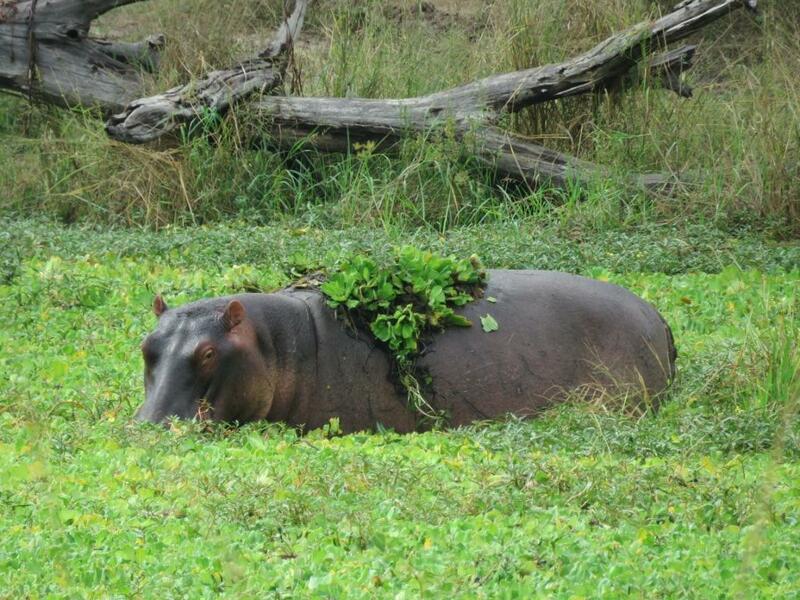 However, hippos seem very unimpressed by humans as long as you keep your distance and don’t disturb their grazing. You will often find them walking through the Camp at night, in search for the greenest grass, or will get woken up by their munching noises. It is essential to always use your torch at night (and not a cell-phone torch) and always be aware of your surroundings. 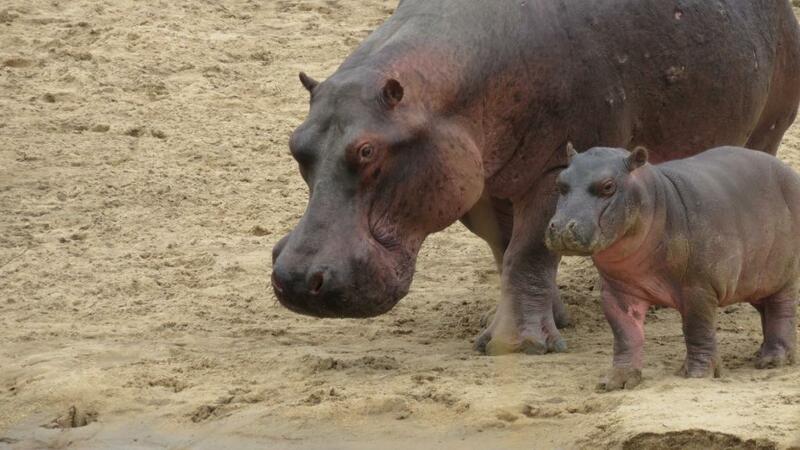 Interesting Fact: Although hippos move through the water, they can’t swim. They move around by bouncing off the water and pushing themselves off other objects. 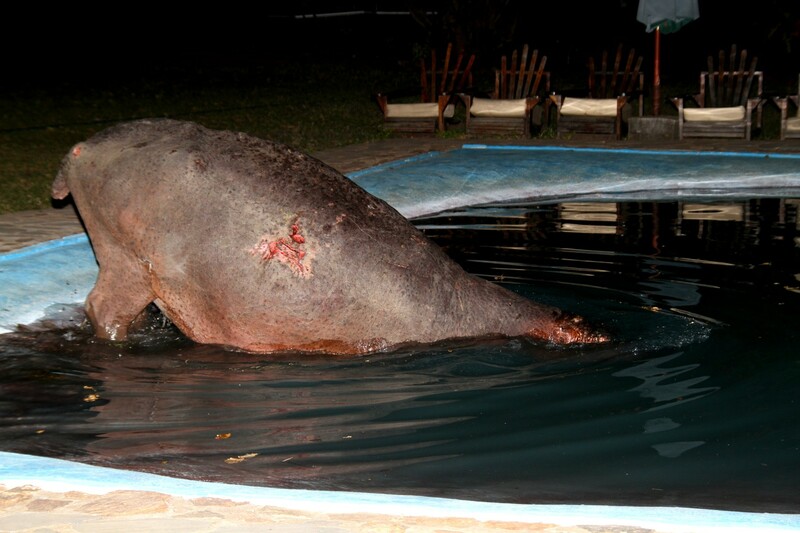 Another good advice: Always check the Swimming Pool before taking a swim (especially at night). 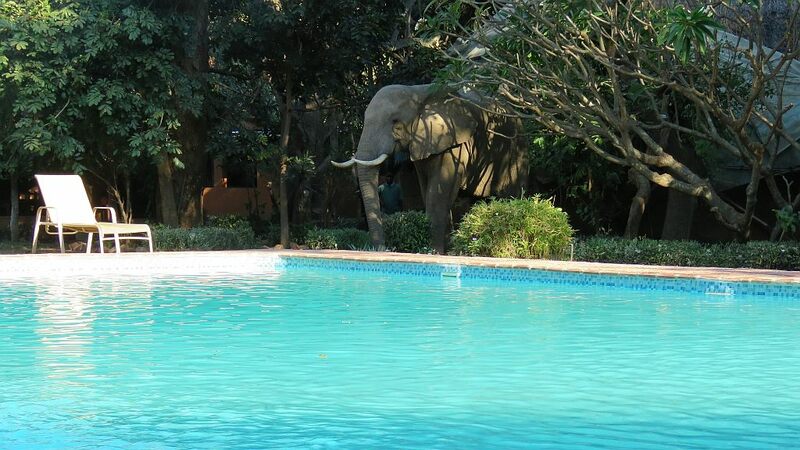 We had elephants, hippos and crocodiles stopping by for a swim in the past, so be aware. 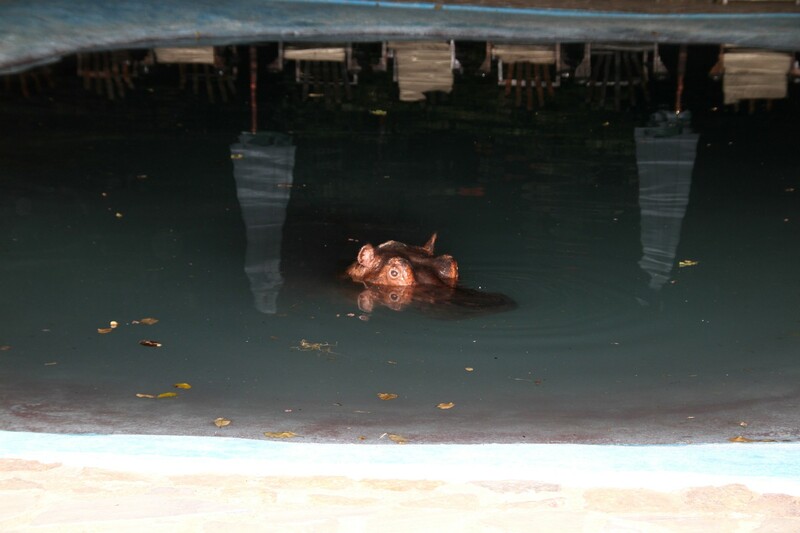 Although a fat hippo in the Pool should be rather obvious, better safe than sorry.